Kuroko's Basketball seems innocent enough. It's a popular basketball manga that debuted in 2008 and was turned into an anime earlier this year. You wouldn't think it would incite threats of revenge, letters mailed with strange substances, and a rash of Kuroko's Basketball cancellations. But it did. Since October, threatening letters have been mailed to locations linked to the creator of Kuroko's Basketball, Tadatoshi Fujimaki. One of the letters was sent to Sophia University, which Fujimaki attended. According to Sankei News (via ANN), the letter read, "I hate Tadatoshi Fujimaki, who is now a famous Sophia University alumnus. I wanted to take revenge on Fujimaki himself, but could not find his location. I had no other choice but to target here." Then later that same evening in the university's gym, a student discovered a receptacle that contained liquid that smelled like sulfur. One source close to the investigation said it's possible the liquid could have become deadly if it vaporized. 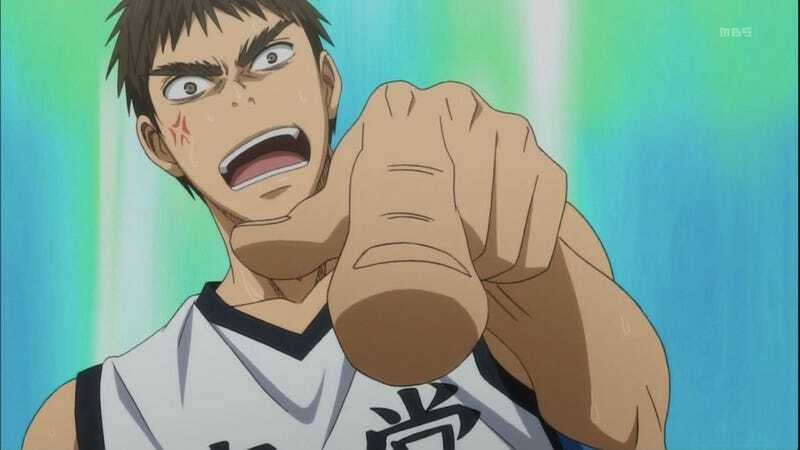 Threats with suspicious white powder or liquids were sent to Fujimaki's high school, his publisher, organizers of a Kuroko's Basketball fan event, a radio station that broadcasts a Kuroko's Basketball radio show, and even the Osaka television station that ran the Kuroko's Basketball anime. According to Sponichi (via ANN), that last threat warned against running a second season of the anime, adding, "I'll use fire, a knife, a gun... whatever I can get my hands on!" "I'll use fire, a knife, a gun... whatever I can get my hands on!" More recently, the upcoming Jump Festa, which usually shows off new games and anime, was threatened, causing organizers to can the planned Kuroko's Basketball stage event out of security concerns. Goods related to it will also not be available for purchase at the Jump Festa. Today, Sponichi is reporting that yet another Kuroko's Basketball event has been canned. This one was to be in Fukuoka, but there were threats that read, "If you don't cancel the event, there will be lots of causalities." This latest event was going to be at a fan event at a local bowling alley, but according to Mainichi, the letters—which contained a suspicious chemical authorities are now analyzing—were apparently sent to various locations throughout Fukuoka as a frightening scattershot. Part of what has made it difficult to catch the suspect is that the letters have been sent from very different locations. According to Sankei (via ANN), the suspect might have given a clue to his identity last month when he apparently wrote this on Japan's largest bulletin board, 2ch: "If you ask Fujimaki, you will know who I, the suspect, am."